Greetings trash picker-uperers and hashers! COME OUT AND KEEP SHORE DRIVE GREEN!! We'll again to gather to groom our section of Shore Drive and subsequently celebrate our civic accomplishment with libations such as a big-assed cervesa or a margarita along with muy delicioso victuals at La Herradura. Socialize for a few minutes prior and enjoy a selection of non-caffeinated drinks including beer and maybe something extra. We'll start our task at 11AM-ish and adjourn to eat at approximately noon. 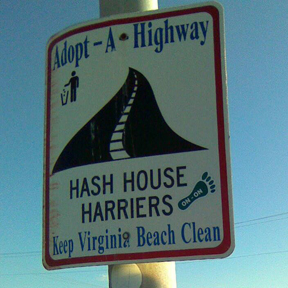 Gather with your $5 friends to groom Shore Drive from Pleasure House to the Lesner Bridge. We'll pick up the detritus of those weak-minded quasi-humans that pollute our environment and then celebrate our civic accomplishment with a big-assed cerveza or margarita along with some succulent Mexican victuals at La Herradura. Join us! Patches?? You bet - after attending six TPUs. *This continues to satisfy the hare requirement for naming ... so if you are too frightened to lay a trail, but not afraid of what we may call you ... come out and join us for an hour of fun. HE IS ALWAYS ON THE BOOK OF FACES.